Dubai, United Arab Emirates, 6 February 2019: Dubai Culture and Arts Authority (Dubai Culture), the Emirate’s dedicated entity for culture, arts, and heritage, concluded its Agricultural Environment in the UAE segment, which took place as part of the 9th edition of the Live Our Heritage Festival, one of the longest-running heritage festivals in the UAE. Recording a remarkable presence at Global Village, the leading multicultural festival park of the Emirate, the Festival introduced visitors to various aspects and features of the UAE’s rich agricultural heritage. During this, the visitors got a chance to learn and explore the agricultural environment in the UAE, and how it differs, in terms of geographical diversity, across different regions within the country. The segment was a tribute to the UAE’s agricultural history that remains a testament to the genius of Emiratis, who created traditional crafts and remarkable engineering systems, like building water channels and inventing groundwater extraction methods, to adapt to the harsh environmental conditions. 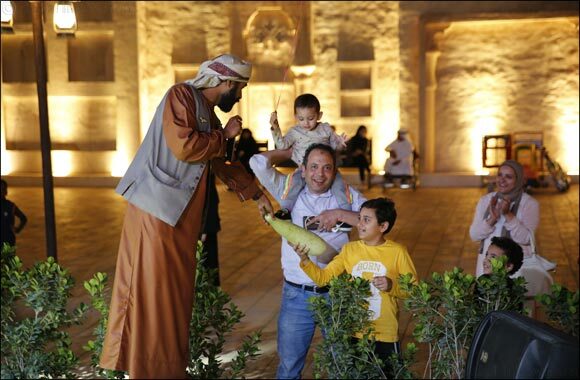 Themed Treasures of Heritage from Emirati Culture, this year’s Festival was divided into four segments, in order to shed light on the different environments in the UAE: Bedouin, Mountainous, Agricultural and Marine. The next phase of the Festival will take visitors to the world of marine, its history and how it influenced the cultural landscape across the UAE. The ancient agricultural villages in the country encompass traditions like farmers’ connection to the land, their interaction with the surroundings and their ability to devise natural tools to earn a living. There are several traditional crafts and industries that find their origin in the historic agricultural environment of the UAE, including: Al Safafa, Al Yazrah, Al Zafana, and Al Midbasa. The Dubai Heritage Development Centres are playing an active role in the Festival by familiarising visitors with the culture of the country, through a variety of traditional games, which are an integral part of the UAE’s heritage. Using simple tools that promote happiness and strengthen ties, these games bring joy to visitors, underlining the country’s environmental practices. The Centres are also organising folk performances that celebrate the national history. Other customary practices being highlighted include living art forms like oral traditions, performing arts, ceremonial customs, and the knowledge and skills required to execute the aforesaid. The Festival welcomes all Global Village visitors, every day, from 5 pm to 10 pm, allowing them to enjoy the colourful program, featured workshops and events that are educating visitors about art and culture across the UAE’s environmental spectrum. Dubai Culture aims to enhance Dubai’s cultural scene and draw attention to the UAE’s rich heritage. The Authority’s mandate is to build bridges of constructive dialogue between different civilizations and cultures to enhance Dubai's position as a creative and sustainable global city for culture, heritage, arts, and literature, with the aim to empower these sectors by developing creative and innovative projects and initiatives locally, regionally and globally.